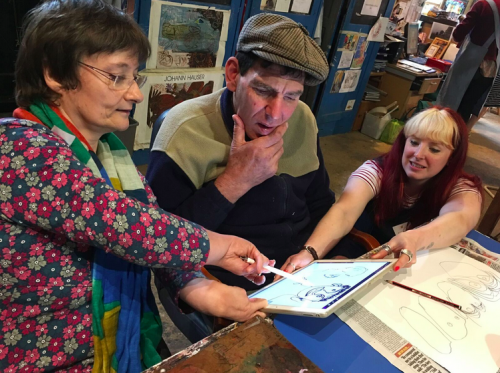 ArtStudio01 was set up in 2015 by Learning Disabled artist Alison Picknell and Disabled Artist Tanya Raabe-Webber, working across Telford and Shropshire. They are now an artists collective of nine artists with a studio space within Participate CIC studios in Shrewsbury. 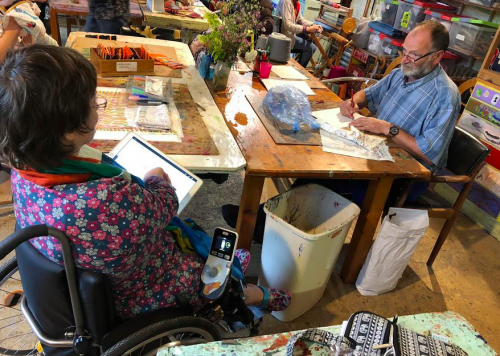 The aim is that disabled, learning disabled and non-disabled artists can work alongside each other on their own work and on their own terms, supported when they need it. 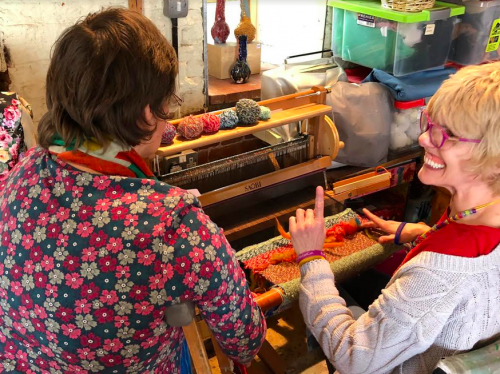 The hope is that the findings of this research can be implemented into the ArtStudio01 to allow it to grow, to develop the artists professional practices, including collaborative working through peer support and residencies. Next year we are planning an exhibition and workshops at ArtStudio01 within Participate, as well as a sharing day to talk about what we have learnt. Artist Cameron Morgan from Project Ability in Glasgow will also be exhibiting work and completing a three-day residency at ArtStudio01. Our first visit on 31 May – 1 June 2018 was to the art barn at Barrington Farm in Walcott, Norfolk – A day service offering activities for learning disabled people, with an art barn supporting over forty artists each week. 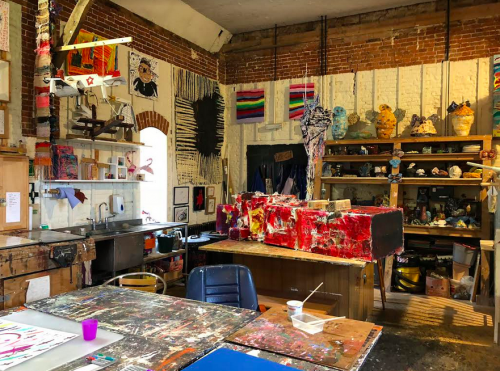 We decided to travel here during Norwich and Norfolk Open Studios, which also meant we caught a tour of the open studio and an artist talk with learning disabled textile artist James Gladwell. I am a Trustee for Barrington Farm so I have visited the centre many times, but Tanya what were your first impressions upon entering the art barn? The artists had gone for a tea break when we arrived, so there was presence of the artists, left in motion. The walls and shelves were jam packed with artworks for sale, and the tables were awaiting the artist’s next step in their making. Tanya drawing James Gladwell drawing Tanya! It was great to hear from Lorna, the art barn manager, about the day-to-day running of the space, the different support needs of the artists, but importantly that they are ‘artist led and not staff led.’ There are five facilitators working across the week in the art barn, whereas Tanya in ArtStudio01, you are the main facilitator, has this made you think differently about this? I really see myself as a fellow artist and creative enabler and not really a facilitator. As a fellow artist it’s really important that I practice my own work in our studio, which is proving difficult when I’m enabling and mentoring the artists. So I’m now thinking creatively about how to enable myself to do my work within the studio! Barrington Farm invite outside groups come in for projects or specialist art areas, and they submit work to ‘Cley’ – the annual contemporary art exhibition in North Norfolk. Funding does impact projects or competitions that they would like to do though. With the curator Sarah Ballard, we learnt about the need to store work safely, to archive important works and to document it well. Tanya is there anything else that you’d like to share that we learnt? I really liked the sense of identity within this process – the artists are directly involved in the process of storing and choosing the work that they keep. The artists customised all their plan chest drawers, so there was a sense of ownership. Storage and archiving our work is part of our practice already, it just needs formalising so we can get the work out there with clarity. 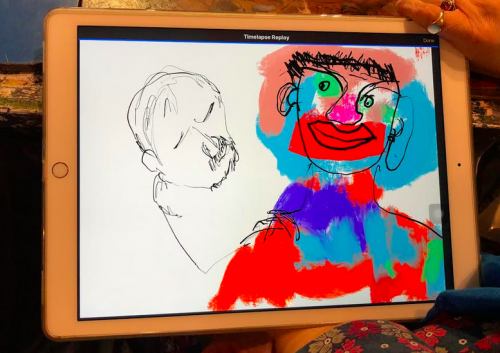 Finally, as is natural to Tanya, she did some portraits of the artists on her iPad Pro whilst there. Tanya, do you want to explain more about this? I am an artist and drawing what I see gives me a real sense of self, identity and completely immerses me into thinking and looking at what I’m experiencing. The art of portraiture is a theme that easily connects us and is recognised a lot in the work of learning disability led work. My iPad Pro/iPencil is a fairly new addition to my arts practice and by sharing this with the artists as part of the R&D I am learning about its potential in terms of collaborative practices. Watch our social media (instagram @j_lgallery and @tanraabe) to see our next visits to the Arthouse Wakefield, IntoArt in London and ActionSpace in London.